SCVHistory.com SW1701 | Newhall | 'Live Oak Manor' Rock Arch Erected 1926, Relocated 1930 for Road Improvement. "Live Oak Manor" Rock Arch. Erected 1926, Relocated 1930 for Road Improvement. The Newhall Signal and Saugus Enterprise | July 22, 1926. J.E. Olmstead is adding to the beauty of his ranch at Oak Glen by building a stone archway over the entrance. He has recently completed the remodeling of the residence, making it one of the finest homes in this locality. Contract Let for Road Change. The Newhall Signal and Saugus Enterprise | October 17, 1929. The contract was let last week for the change in the road leading north from the tunnel. The change cuts right into the bluff, and crosses two canyons, rejoining the present road at the gate of J.E. Olmstead's Oak Manor home, and coming on down the hill with a change taking out some of the hill curve. The survey indicates that the archway at the Oak Manor gate must be changed. A Los Angeles firm, the McCarey Company, got the contract for the grading and paving, which will be of Portland cement concrete, it is stated. Work is to begin very soon. The Newhall Signal and Saugus Enterprise | January 9, 1930. The construction of the new road across the Needham ranch has made necessary the moving of the stone gate way at Live Oak Manor. Mr. Olmstead is having it moved intact. It will be moved back about fifty feet, and turned about a quarter round, to align with the highway. The stones in this arch were specially selected by Mr. Olmstead, and it took him several years to make the collection. 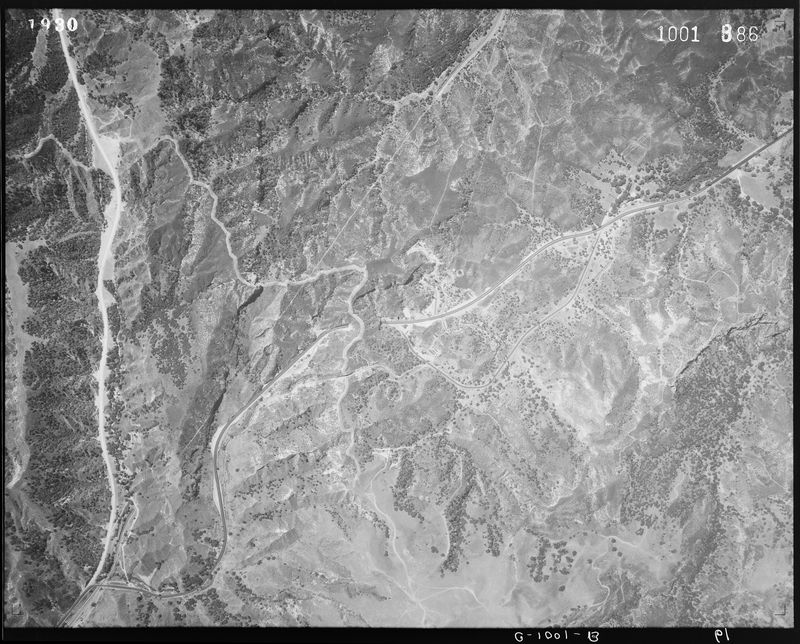 Detail from this compilation of aerial photos made in July and August 1930, soon after the rock archway was moved and the road was improved. 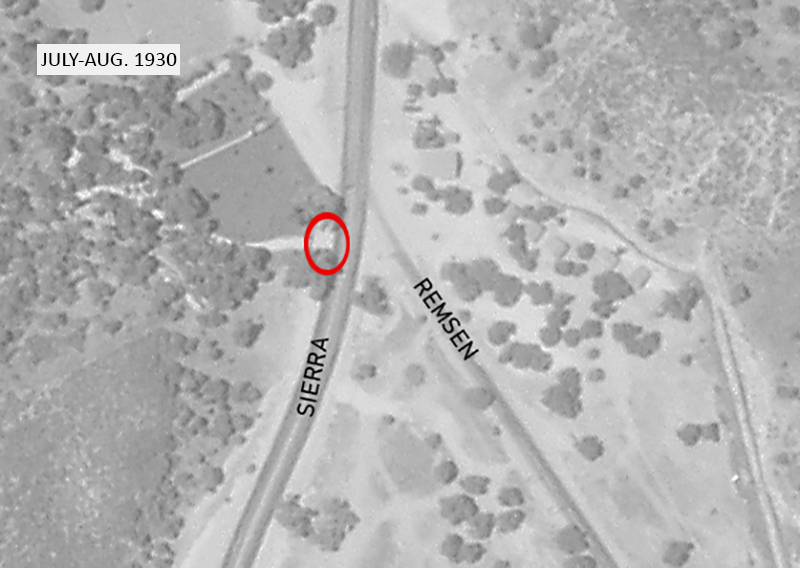 It appears the paved, two-lane roadway in this photo became the southbound (aka westbound) lanes when Sierra Highway was widened to four lanes in 1938. In 1939, when he shuttered his Live Oak Manor Cacti Gardens, owner John Olmstead said the new divided highway had made the gardens inaccessible to northbound traffic.